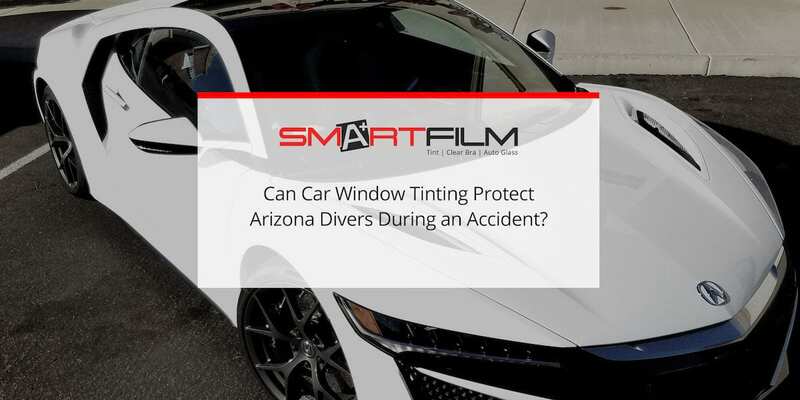 Home SmartFilm Can Car Window Tinting Protect Arizona Divers During an Accident? Though our desert state enjoys clear skies and a mild climate, we unfortunately have as many car accidents as anywhere else. When it comes to accident preparedness, nothing can be overlooked. One precaution that you can take is to have car window tinting installed. Arizona drivers can experience multiple accident-related benefits from outfitting their vehicles with window tinting. According to the Arizona Department of Transportation, rush hour traffic is one of the most common times for drivers to get into an accident. Between the stress, heat, increased volume of cars, and unsteady pace of traffic and the sun’s glare that can literally impair your visibility, it’s no wonder that rush hour is such an accident-prone time of day. Fortunately, car window tinting provides Arizona drivers with a number ways to reducing their accident risk, addressing several of the important risk factors listed above. First and foremost, car window tinting dramatically improves visibility by reducing the sun’s glare on your eyes, allowing you to see the flow of traffic more clearly. Second, having car window tinting on your Arizona vehicle is especially handy for keeping you comfortable and focused while driving by reducing 35-65% of the solar heat and 99% of the UV rays entering the windows, instead of causing you to get flushed and flustered from the heat and traffic. Finally, during an accident, car window tinting adds another layer of shatter resistance to your windshield and other autoglass due to its anti-shatter design. Because of these safety reasons and more, accident-conscious drivers would be wise to install automotive window tint on their vehicles. Call the Car Window Tinting Experts in Arizona at Smartfilm! Contact us to learn more about the benefits of car window tinting for Arizona drivers and their vehicles and schedule your consultation appointment with us today!